This is a transcript of Greg’s message at Equip Gauteng 2016. There are so many people preaching about the Holy Spirit who haven’t come to the place where they know what it means to be ministered to by Him. His role in the church is absolutely critical. Scripturally, we understand that Jesus is in heaven at the right hand of the Father. So when we say things like, “Jesus is in my heart,” or “Jesus is leading the church,” or “Jesus is here,” we are referring to His Spirit – the Holy Spirit. Jesus led His group of disciples, encouraged them, and was very firmly in charge. He commissioned them, He sent them, He told them what to do, where to go, and asked for a report when they got back. When He promised the disciples that the Holy Spirit would come, He said it was better that He goes, and He calls the Spirit our helper, comforter – one exactly like Him, sent in His name (see John 14 and 16). Does it not follow then, as an obvious fact, that the Holy Spirit has the same level of leadership Jesus had? His role in the Church is exactly what Jesus’ role was among His disciples: He directs, He calls, He speaks, He encourages, He gets report back from us etc. The Holy Spirit leads what we do. Well that’s how it should be. When Jesus was among His disciples there was action. When the Holy Spirit is in the Church there should be action. We need to settle who leads who in this relationship and what we have the right to expect from the Holy Spirit. These men had no idea what they were waiting for, what it would look like, or how they would even know when they received the gift. Jesus didn’t give them all these details but just told them to wait. Jesus knew that when the person of the Holy Spirit invades a situation you know He’s arrived. You’re not left guessing. He doesn’t need a whole lot of work and preparation from us beforehand, He can just do what He does. If you were to get lost on a desert island as a child and could read, and the only literature you have is a Bible, would you agree with me that if you read it ‘unblinkered’, with no previous teaching or bias, you would come to the conclusion (when you reached the New Testament) that the Holy Spirit is as crucial to the Church as air is for breathing? Would you also agree that you would read your Bible and come to certain conclusions, but you would go to a church and have to come to different conclusions? The New Testament reveals to us that the Holy Spirit led the first Christians to do unexplainable things, to live lives that did not make sense to the culture around them, and ultimately spread the Gospel in an unstoppable way. There is a massive gap today between what we read in Scripture and what we see around the world. Without Him we cannot accomplish much at all. It’s another obvious fact in modern church history that the Holy Spirit tends to show up in power in places where he is sought for the most – where people are hungry for Him, they create an environment for Him to truly be who Jesus said He would be. Where they hunger and thirst for Him, asking and seeking and knocking… that environment seems to attract a deeper presence of the Holy Spirit. So what kind of environment are we living in? We can learn something from the disciples’ experience of walking with Jesus during His earthly ministry. This encourages us because we see so much of ourselves in it. Their understanding of spiritual things was faulty. They kept coming to wrong conclusions and He kept having to help them. They misunderstood Him frequently. But in the midst of their relationship, Jesus was able to touch them and transform their lives beyond the limits they were constantly setting. In spite of their misunderstanding him, in spite of their misunderstanding of spiritual things, Jesus was still able to break through and do things with them. In John 15:3 Jesus says to them, “Already you are clean because of the words I’ve spoken to you.” They had not yet received a revelation of the atonement, of the death of Jesus on the cross and his atoning blood. It hadn’t even happened yet, but He made a statement and they believed Him, and their experience of being clean came first and understanding only came later. This should give hope to you and I and the churches we are a part of. The disciples loved Jesus, trusted Him, wanted to learn from Him, and honestly meant to obey Him in the light they had at the time. That’s all we need, not full understanding of everything. This has been the same experience we’ve all had from being born again. You didn’t understand everything about salvation before you got saved. You got saved then the Bible says you work out your salvation with fear and trembling. You begin to understand what God has done for you. You begin to understand the gift of eternal life, the filling of the Holy Spirit, and all Jesus has done. Our lives are changed first and then we, like the disciples, catch up with what God has done and wants to do. I’m saying all that to say this: our experience today is going to be exactly the same. We are going to experience the Holy Spirit and only afterwards are we going to understand. He leads and we keep in step with Him. We cannot draw lines and then ask the Holy Spirit to come and fill them. Like the disciples, we just need to trust. This is very definitive language that Jesus uses. It means we are being invited in. Jesus is inviting us into this relationship with the Holy Spirit. He is anointing us. In scripture, the anointing referred firstly to an oil that was scented very nicely and put on things for symbolic reasons. Guests that came to your house would be anointed with this oil, and it was also for the sick and the dead. It was for consecration of the High Priests and the priests, and it was for the consecration of kings. It then also works as a picture. Even Cyrus, who didn’t know God, served God because it was said he was ‘anointed’ for that task. The prophets were anointed. The tabernacle was anointed. And the spiritual gifts carry an anointing. Here John expresses his extreme confidence in the power of the divine anointing. The sum of God’s gift of the Spirit accompanied by the Apostolic word from the beginning was abiding in them (verse 24). To anoint means to ‘set apart’ or ‘consecrate a person or an object for sacred use’ according to the Strongs dictionary. It’s important to note that the person or the object is only anointed or consecrated in terms of their relationship to the Lord. It has no intrinsic value and derives all of its value in relation to its relationship with God. But here’s the point: the test of the anointing is its fidelity to that which was from the beginning. Fidelity means faithfulness to a person, cause or belief, demonstrated by continuing loyalty and support. 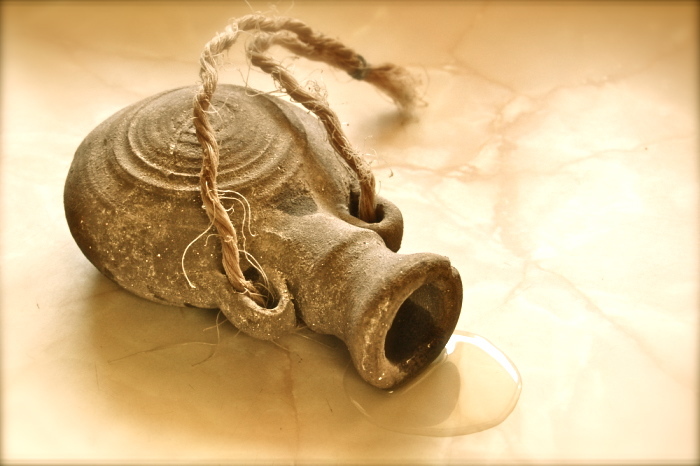 John is dealing largely with the heresy of gnosticism in 1 John, and he is essentially saying that the test between the true anointing versus a false anointing has to do with fidelity – letting what we heard from the beginning abide in us. The test that the anointing you and I claim to have upon our lives and upon our churches is our faithfulness to what the Bible means when it talks about what the Holy Spirit does in and through our lives – what the Bible says ‘from the beginning’ on such matters. So we’ve got to go back to scripture and ask how faithful are we to what we see in the Bible? When you and I stand in front of our churches and minister to people, or we stand in front of the world, our fidelity is being tested. So what does the Bible say about the Holy Spirit? Firstly, the Holy Spirit is a person. He is not a spook or a flavour or atmosphere or a feeling or sensation or ‘the shakes’. Secondly, there are implications to how you and I claim to follow the Holy Spirit. We must keep in step with the Spirit, says Romans 8 and other scriptures. But keep in step for what? Where is He going? What is He doing? As we can see in these scriptures, the Holy Spirit hears from heaven and tells us what heaven is saying, and we must do what we’re being told to do. In some of our churches today though, I’m convinced we think the Holy Spirit has to hear what the preacher is saying and He must do that! That’s why there’s no power! “26 But the Helper, the Holy Spirit, whom the Father will send in my name, he will teach you all things and bring to your remembrance all that I have said to you. 27 Peace I leave with you; my peace I give to you. Not as the world gives do I give to you. Let not your hearts be troubled, neither let them be afraid. In these passages quoted, what is it that we are instructed to know and have faith for and walk in? What will He teach us? What God wants us to know, what is on God’s heart, what Jesus said. Then more importantly, He is going to teach us what Jesus meant by what He said, because what He says and what He means is sometimes different. For example, He says, “Eat my flesh” (John 6:56). He didn’t mean that literally. He didn’t mean we must hate our mother and father (Luke 14:26) but was using hyperbole. But He will teach you what Jesus wants you to know. Jesus said, “Peace I leave with you; my peace I give you.” (John 14:27). How is He going to give us peace? By the Holy Spirit. Peace is not the same thing as a truce, which is when two parties agree to cease hostilities for a while, either from exhaustion or to re-gather strength for the next conflict. Peace is the the result of a victory; the consequence of a battle. It is when the enemy has been defeated in areas of our lives. When Jesus says, “Peace I leave with you,” the Spirit who searches all things will get into your life find areas that need a victory and lead you into battle, and then peace comes through overcoming the enemy. That’s why Jesus said “my peace I give to you”. This is to be understood in the context of the cross where Jesus said, “It is finished.”(John 19:30.) He will give us peace – peace in the home, peace in the church, peace in our lives. Jesus said the Holy Spirit will testify about Him. All revelation, all ministry, all direction, and all power is from the Holy Spirit. And he will always direct you and I and our attention to the will and to the ways of the Lord Jesus. Jesus will always, always be the center of what we do because it’s only at that name that the enemy backs off; it’s only in that name that authority is set in place. This helps us from going astray with wrong emphasis that come into the Church from time to time. We can all get besotted with stuff, and the Holy Spirit says He will bring us back by speaking to us about Jesus. The Holy Spirit will always be involved in reaching lost people – convicting of sin and righteousness and judgment. He is specifically tasked with this. Acts 1:45 says, “you will receive power when the Holy Spirit comes upon you will be my witnesses to the ends of the earth.” That power from the Holy Spirit is to be a witness. He is specifically tasked to apply the finished work of Jesus to lost people. How then can a church claim to have fantastic fellowship with the Holy Spirit when there is almost no salvations in that church? If your church hasn’t had someone saved in six years, there’s a problem! We need to get back to the place of saying, “Holy Spirit, come in and lead us like Jesus led the disciples. I’m prepared to take a step back.” I’m almost bold enough to say that in some churches, in terms of the plan for the morning, there’s no space for the Holy Spirit to come in and minister. Our people know that but we’re such control freaks sometimes and we don’t want things to get messed up. Friends, we have to change our minds about these things. What is the Holy Spirit hearing? And where is He hearing it? He is not hearing things in your quiet time, He’s not even hearing things in your church prayer meeting, or in your forty day fast (for whatever reason you do that). He is hearing from the Father at the throne. We all say “Amen” to that, but I just want you to think about something for a moment. When the Holy Spirit comes and ministers a word to us, where did He get it? In heaven. What’s happening in heaven? Since the times of the acts of the apostles, John received the revelation of what’s going on in heaven and penned the book of Revelation that finished the canon of scripture. In there we see there that there is a Lamb and a Lion in heaven. There is a throne. There is a Father in unapproachable light. There are scrolls with seals being unfolded. There are living creatures. There are angels being sent from to and fro. There are peals of thunder and lightning and instructions coming down. There’s plenty going on and a real urgency, and the Holy Spirit goes into that context and hears. From the Cross to the Great White Throne Judgment there is this time on earth where everyone’s eternal destiny is in the balance. There is activity and action and judgments happening in heaven, and the Holy Spirit hears the urgency of heaven and comes to earth and speaks to us. But then a pastor gets up and says a few random things and claims that it was the Holy Spirit who spoke to him. Really? The Bible says He will hear from heaven and He will tell you what’s to come. In other words, there’s not enough of an eschatological perspective in our prayer meetings, in our focus and our urgency as churches. We’re trying to get the Holy Spirit to do things such as make Sally like Peter, when there are much bigger things going on! We are not getting to grips with what the book of Revelation says! We are so stuck in group-think sometimes we’re not listening to what the Holy Spirit is actually saying, what we can see in the book of Revelation – the outflow of history, judgements, everything hanging in the balance… the urgency of it all. We are filtering everything through what we’ve always filtered it through, instead of asking some hard questions about what the Holy Spirit is actually saying. It was an eschatological moment. The Holy Spirit had not yet been poured out but here was a man already filled with the Spirit, having heard from the Spirit that he would not die before seeing the Lord’s Messiah. How do you cope with that if you do not believe that the Spirit goes to heaven and hears from heaven (not from earth) and speaks to us about what’s to come. When the Holy Spirit starts to minister into our lives and in our churches, He tells us about what’s going to come – He tells us the big picture realities – and we see the book of Revelation speaking about all nations, tribes, tongues, and languages – the Gospel reaching everyone. It’s not about us and what we’re doing and our feelings, it’s about us going out with the Gospel. This is the sort of thing we should expect to hear from the Spirit. Only the Holy Spirit can make someone a Christian. Not church attendance, good morals or self-righteousness. That means that unless He has done the work, the work is not done. Stop painting people as saved before they actually are! Wait to look for fruit. “Repeat after me” does not mean that person became a Christian – you are not a Christian because you were led in and prayed the sinner’s prayer. You’re not even a Christian because you believe in your heart and confess with your mouth! You’re a Christian when the Holy Spirit regenerates you. It is a supernatural work by the Holy Spirit who makes you new on the inside. It’s not your prayer. Your prayer is the faith that attracts him, but it is God who makes you new. Make room for God to do it. When God happens to you, you know. You don’t wonder about it or second guess. He regenerates. Stop calling people Christians until you know they are. He sanctifies. That means He makes people into the likeness of Christ. He brings peace into our lives. He goes into areas that need a bit of conflict, that need a bit of victory, and He brings his action to it. One of the elders at newDAY told me once that he was having a quiet time one day and the Lord said to him, “You and I are incompatible, and I don’t change.” We need to be the one’s changing, not Him! He sanctifies us according to His ways! The fruit of the Spirit, the non-negotiables, become markers along the way to know someone is being sanctified: they love the Bible, they start loving people, they love to be at church, they love worshipping, they love praying… we know then something’s happening inside; we can see the evidence that they’ve been born again. Don’t paint them as saved too quickly. Do we also understand that it’s the Holy Spirit who convicts and sometimes He has to convict against the way we’re convicting, because He knows what’s really going on in the depths of someone’s heart. Please minister to people from where they’re at and not from where you’re at. You can’t go to someone with your thirty years of experience as a Christian and expect people just to know things and act like you, when they haven’t even figured out where each book of the Bible is yet! But if you tell them them to walk with the Spirit, He will instruct, He will teach, He will search the deep things, He will separate soul and spirit and will get in there and will do what only He can do. His convicting work comes from the heart of a very gentle God, a very caring Father who says it is the kindness of God that leads to repentance. (Romans 2:4.) It is Him and His goodness that will minister. He will work through the issues. Sometimes we get frustrated with people and start telling them all sorts of things and claim the Lord is saying this or that when the Lord is not saying any such thing to them at all! We’ve got to be very careful about what and how we are saying what we are saying. In sanctifying He breaks strongholds, He renews our thinking, He gives us the mind of Christ corporately as we continue to grow in him, He sets us free from demonic influence and oppression. We are carrying things around us that we need to be broken free of. He breaks every chain. God will give us the Holy Spirit and He will remind us about those things we need to be faithful to – our fidelity to that which was from the beginning. Some of us who’ve lost it a bit need to go back to the beginning and look at what God gave you then and what you did then and see what’s missing. He releases the power of heaven for us in service of the Kingdom of God. If that’s true, how are we equipping our people for works of service? What mechanisms have you and I put in place in terms of church meetings, special training times, home groups, inviting Ephesians 4 gifts in certain areas to come and equip people for further works of service? We don’t have it all. Who are we speaking to? Who are we inviting in, that we may learn how to receive from the Spirit? That we may learn how to give? The Holy Spirit puts in place, anoints and releases the Ephesians 4 gifts; the elders; the deacons; and the saints in our churches. Anointing is a salve. If you put oil on a pulpit, when the next person gets up and touches it, their hands will slip and they will smell the sweet fragrance of the oil. “We are the aroma of Christ to God among those who are being saved and among those who are perishing.” (2 Corinthians 2:15.) We need to remind our people that the day you became a Christian you were anointed! The Holy Spirit came upon you and started to put the fragrance of Christ upon and within your life! He anointed you for service. But remember deacon, elder, Ephesians 4 gift, your work of service is purely in relationship to your walk with Him. Your value is derived from your walk with Him. Paul said when he and his team came to the Corinthians his speech and message were not in plausible words of wisdom, but in demonstration of the Spirit and of power (1 Corinthians 2:4). This was because he had a close relationship with Jesus. Jesus was very firm in his leadership style and he led his disciples firmly. We should expect the same leadership style from the Spirit. Leaders need to learn how to keep in step with the Spirit and walk with Him, and not grieve Him. I’ve heard it said, and I don’t agree, that the Holy Spirit’s character is like a dove, and therefore one false move from you and He flutters off somewhere. I don’t agree with that because Jesus has stated very clearly in the Bible that He will never leave or forsake us. That means that there are times we are listening to the leading of the Spirit and as He leads, as we are led by Him, we bring him great joy; and there are times we choose in our leadership style and personal choices to go another way and He is grieved. But because of His faithfulness he won’t leave us or forsake us – He continues to walk with us, even though He may be grieved. As we study this subject of the anointing of the Spirit, let’s get back to what the Bible says. Let’s practice fidelity to what we’ve received as the Church from the beginning. As we get back to what we know God says, the joy of the Lord becomes our strength again. And we begin keeping in step with the Spirit. Let us therefore become far more open and aware and submissive to the leading of the person of the Holy Spirit.